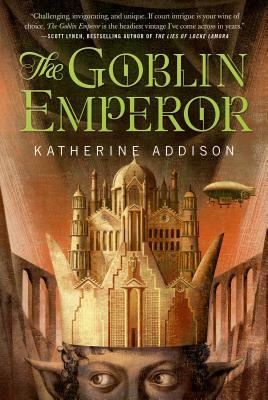 If I were to name one thing I liked best about The Goblin Emperor by Katherine Addison, it would be the main character. Maia is hard not to like. He is the fourth (read: forgotten and neglected) son of the emperor who, together with all of Maia’s older male siblings, dies in a zeppelin crash. Maia is essentially exiled in some backwater village when he receives the news of his father’s death. He is supposed to travel to the capital city and, well, start governing. Maia has to find allies, learn about the court and government, and also deal with the fact that his family’s death turns out to be far from accidental. The Goblin Emperor is a book that I really enjoyed, and yet would hesitate to recommend to everybody. You will like it if the following are your cup of tea: very elaborate world-building, complicated naming conventions and forms of address, and court intrigue. Lots of it. The names are hard. There is a list of dramatis personae in the back of the book, as well as (belatedly discovered) by me, a short introduction to the forms of address, suffixes, titles, and so on. I really would have liked to have the latter in the front. That way I know I’m going to have to deal with people being mentioned by only parts of their names plus title, or full names, or some other combination thereof. In fact, I felt like I needed to finish this book within two-three days, or risk having all these characters and names disappear from my head completely. Before you run away and vow to never open this book, consider that this is a court of elves and goblins. As you read, you realize that elves and goblins would really have all these long names with ‘cs’ and ‘zh’ sounds in them. Elaborate forms of address and levels of polite speech seem quite fitting. It doesn’t always help you figure out who is who, but it does help appreciate the complexity. I was sure all those ”thou”s were going to bug me throughout the book, but somehow they didn’t. It is not a particularly fast-paced book, but it was absorbing. I found I started to enjoy it more when all characters were finally in place and all introductions were made. It also seemed that later in the book Addison started to add little extras to her descriptions, like ear movement to indicate different emotions. Plus, it helped to realize that not only Maia was the fourth son nobody had expected to rule, he also looked markedly different from the largely elf-populated court (something that oddly enough did not strike me as obvious right from the beginning). Finally, Maia is what makes The Goblin Emperor essentially feminist fantasy, despite strict court conventions and gender roles. Maia is very firm in his opinions that women can do the same things men can do (or not do, when it comes to raising children and staying at home). This is quite apparent in his conversation and his treatment of women at court. This just makes him even more likable. By the way, Katherine Addison is also Sarah Monette, and her Melusine novels are fantastic (Mélusine , The Virtu, The Mirador, and Corambis). They are not about goblins. I quickly discovered I didn’t care about the language, partial because we struggled with it right along with Maia. Good review, I completely agree. If we assume that reading speculative fiction is a skill (Jo Walton had a post on that at tor), then The Goblin Emperor is definitely for a high level of expertise. Your review pretty much reflects how I felt about the book. Agreed that it’s not for everyone, I enjoyed this book but would also hesitate to recommend it widely. I’m not sure if I would have taken to it this much if I hadn’t been in a particularly kind of mood; its quiet, softly glowing tone is really more suited for an afternoon of introspective reading. Agreed, it did require some concentration and time commitment. My friend and I compared it to Nicola Griffith’s Hild.